The following Zephyrhills High School band members recently performed in the University of Southern Florida's Festival of Winds: Jason Edwards, Robert Holt, Norman Kline, Matt Peters, Douglas Phillips and Kristie West. The winners of the recent Future Business Leaders of America Cover Girl Calendar Pageant at Zephyrhills High School include: Lisa Black, Maria Barton, Ari Briton, Danielle Campbell, Deana Deno, Brandi Pattle, Lisa Raden, Dawn Randall, Amanda Schwab, Terri Smith, Kasey Webb, and Betsy Ann Woods. Deana Deno will be featured on the cover of the FBLA calendar. Students in the Diversified Cooperative Training program at Zephyrhills High School recently competed at the State Leadership Conference in Orlando. Jessica Jones placed first in the state in accounting. Patrilla Henderson placed third in the state in business communications. Voting delegates included Jennifer Bravo, Melissa Ogles, Stacie Remillard and Kim Smith. Rinaldo won her first conference championship two weeks ago and is favored to defend her district title Wednesday in the Class 3A/2A/1A, District 8 girl’s tournament at Sundance in Zephyrhills. Since Zephyrhills apparently will be the only full girl’s team there, the Bulldogs probably will walk into the state tournament, giving Rinaldo a second consecutive state tournament berth, regardless of how she does as an individual. Members of the Zephyrhills High School FFA recently competed in the FFA Sub-District 5 Parliamentary Procedure and Tractor Driving contests. The team finished third overall. Team members included Ken Lawson, Stacy Carriveau, Spence Ritter, Jason Wise, Adam Wilkes, Shawn Pettit, Justin Monbarren, Amy Cartwright and Curtis Williamson. Jennifer Jones, a Zephyrhills High School senior, was awarded Grand Champion Holstein and senior Amy Cartwright was awarded the Championship Ayrshire honors at the Florida State Fair. Robbie Heyward homered for the go-ahead run and eighth-ranked Zephyrhills got two strong pitching performances to stay alive in the 2nd Annual Kiwanis Tournament of Champions with a 2-1 victory Tuesday evening. Heyward's sixth inning blast broke a 1-1 tie and knocked late replacement Florida Bible High School out of the tourney. Florida Bible (10-8) replaced Pasco High School in the field late Monday. Pitchers Tom Hutchinson and Benjie Blessing helped assure the Warriors' trip back to Miramount with some key pitching. The little-used Hutchinson, making just his second start of the season, allowed just two hits and a run in four innings before being replaced by Blessing. "We're trying to bring him along slowly. He did a nice job," Bulldog coach Craig Milburn said. "Benjie came in and held them off." Blessing (4-0) went the last three innings, and allowed two hits. He let a runner get into scoring position every inning, but didn't let a run in. He struck out Juan Chaidez to end the game in the seventh with runners on first and second and get the win in his first relief appearance of the year. "Zephyrhills (12-3) scored first when pinch-runner Aaron Burrman scored on Kevin Russo's sacrifice fly in the top of the fourth inning. Florida Bible answered with a run in the bottom half of the inning. Heyward's homer, his team-leading fourth and second in two days, came off loser Mike Meyers to lead off the sixth inning. "When it was crunch time, we came through," Milburn said. "Everyone around here (Pasco County) has been pitching around him, and he's walked (15) times. He's been frustrated." Each team had four hits. The Warriors advanced only one runner past second base. The Zephyrhills High School Brain bowl Team recently captured the first place District Title in the multicounty competition held at Saint Leo College. The Saint Leo College Bowl, now in its 11th year, is sponsored by the National Student Honor Society and Saint Leo College. This year's winning team consisted of Mandeep Dhalla, Steven Lyons, Jamal Misleh, Joseph Kelly, Harl Krishnaraj, Kenny Kuniyuki, Yuki Kuniyuki. Winners were eligible to compete at the state level Florida Academic Tournament at Epcot Center last weekend. Two 1994 graduates from Zephyrhills High School have garnered the following awards: Yukio Kuniyuki has earned the designation of AP Scholar in recognition of college level achievement on the College Board's Advanced Placement Exams. Kaname Kuniyuki earned the designation of AP Scholar with Honor on the College Board's Advanced Placement exams. president, Thomas Wallace; first vice president, Melissa Braxton; second vice president, Celeste Garrod; treasurer, Angeline Gary; corresponding secretary, Tonya Barrentine; recording secretary, Stephanie McGovern; parliamentarian, Casey Ramirez; historian, Janna Jones; chaplain, Cathy Reeves; sentinel, Zak Waldstein; reporter, Kristeen Whyte. The Zephyrhills High School junior and senior Future Farmers of America chapters weighed in 21 steers for entry into the County Fair to be held later this year. Exhibitors include David Belcher, Jessica Combs, John Combs, Trishia Dunbar, Heather Forsyth, Keith Hayford, Eddie Leldenhelmer, Lorenzo Limoges, Dee Dee Loetscher, Justin Monbarren, David Murphy, Bill Paul, J. R. Rudolph, Bobby Smith, Doretha Smith, Christy Soul, Morgan Steward, Melanie Wilcox, Curtis Williamson, Jason Wise and Matt Wood. Five members of Zephyrhills High School Health Occupations of America (HOSA) attended the 17th annual HOSA National Leadership Conference held in June and placed second in the Community Awareness Project, "Just for the Heart of It." The group received individual and school Silver Medals and a $350 cash award for the ZHS chapter. Students, Machelle Knotts and Gary Griffen were the presenters and appeared on a documenting video. Machelle Knotts also competed as Outstanding HOSA Member, having placed first in Florida, and also received special recognition as a completer of the National Recognition Program. Thomas Wallace competed in Researched Persuasive Speaking and placed second at Regional and State levels. Reina Mixon and Mary Smith served as Courtesy Corp members and assisted with two general sessions. Mrs. Mary Reid Smith served as adviser. With graduation ceremonies happening throughout Pasco County this week, we thought this would be a good time to take a look at the students who truly are at the Top of the Class. Valedictorian: Kaname Kenneth Kuniyuki II. Plans: University of Michigan, Asian languages and political science. Favorite book: Siddhartha, by Hermann Hesse. Most inspirational people: Albert Schweizter, Ghandi and my grandmother. Plans: University of Central Florida, computer science. Favorite book: Jurassic Park, Michael Crichton. Most inspirational people: Both my parents equally, because whenever I've been in need of support, they've been there to give it to me. The following students from Zephyrhills High School were recently recognized during the ninth annual Principal's Review and Awards Ceremony of the Army Junior Reserve Officer's Training Corps-Bulldog Battalion: Lt. Col. Adam Markwardt: Academic Excellence Award and Superior Cadet Decoration, Major Bryan Mason: Senior Army Instructor's Leadership Ribbon, Sgt. Maj. Cody Smith: Superior Cadet Decoration (third year cadet), 1st Lt. Sarena Alexander: Superior Cadet Decoration (second year cadet), Staff Sgt. Corey Marsh: Superior Cadet Decoration (first year cadet), 2nd Lt. Brian Wood: Distinguished Cadet Award for Academic Excellence, Capt. Robert Maxson: Veterans of Foreign Wars Award, Capt. Randy O'Steen: American Legion Award for General Military Excellence, 1st Lt. Norman Scheuerman: American Legion Award for Scholastic Excellence, Capt. Brandi Pattie: Daughters of the American Revolution Award, 1st Lt. Jason Conrad: Military Order of the World Wars Award, Capt. Corey Capehart: Military Order of the Purple Heart Award, 1st Lt. Jason Smith: Disabled American Veterans Award, Capt. Robert Whitacre: America Veterans of World War II, Korea, and Vietnam Award, Capt. Ben Phillips: Retired Officers' Association Award, 2nd Lt. Tony Contreras: U.S. Army Recruiting Command Award, 1st Sgt. Sergio Carranza: Florida Army National Guard Recruiter's Proficiency Award, Capt. Daniel Ruley: U.S. Marine Corps Recruiters Certificate of Merit, 1st Lt. Woods Pepperman: 82nd Airborne Division Association Award, U.S. Marine Corps Recruiters Certificate of Merit, 1st Lt. Melissa Klinedinst: 101st Airborne Division Association Award, Sgt. 1st Class Chris Sawyer: Academic Excellence Award, Senior Army Instructor's Leadership Ribbon, Sgt. 1st Class Johnny Leach: Academic Excellence Award, Cpl. James Carpenter: Academic Excellence Award, Academic Achievement Ribbon, Sgt. 1st Class BJ Booker: Senior Army Instructor Leadership Award, Staff Sgt. Carolanne Overhuls: Senior Army Instructor Leadership Ribbon. Other Pasco County students headed to national Future Business Leaders of America Competition are Kenny Kuniyuki, Yuki Kuniyuki and Mandeep Dhalla, Zephyrhills High School, first in Entrepreneurship at the state level; Robert Holt, Zephyrhills High School, second in Introduction to Business; Elizabeth Smith, Gulf High School, first in Accounting I.
Steven Lyons, a student at Zephyrhills High School, placed second in the individual competition at the Pasco County Math Contest in May. The Zephyrhills High School band recently received an Excellent rating at the State Festival in Lakeland. The following students earned Superior ratings for their solo performances: Douglas Phillips, trumpet; Robert Holt, euphonium; Michael Soule, alto saxophone; Rebecca Phillips, soprano saxophone and tenor saxophone; James Waits, alto saxophone; and Michael Holloway, tuba saxophone. A superior rating also was awarded to the following students in the saxophone quartet: James Waits, baritone saxophone; Rebecca Phillips, tenor saxophone; Virgil Richardson, alto saxophone; and Tony Colwell, alto saxophone. The following students earned excellent ratings: Rebecca Phillips, twirling solo; Michael Soule, tenor saxophone; Norman Kline, trombone saxophone; Christopher Holloway, tuba solo; Sarah Tiemann, marimba solo; and James Waits, tenor sax solo. Erin O'Neil won't be on the course today at Indian wood Golf Club for the final round of the U.S. Women's Open. But for several days she walked the Michigan fairways with the best in the women's game. It was an adventure she won't forget. O'Neil, who graduated from Pasco County's Zephyrhills High School in 1993, qualified for the Grand Slam event as an alternate, getting a phone call two weeks ago that meant she would realize her childhood dream of playing in the U.S. Women's Open. And though her second-round total of 79 was a disappointing, 12 strokes shy of making the cut, excitement off the course more than made her week. "This tournament is just huge," said O'Neil, 19, who will be a sophomore playing at the University of Georgia this fall. "There's no other tournament like it, at least in my eyes. I've been in awe all week." The highlights of her stay are almost too many to mention. Almost. Upon arrival, she learned Ayako Okamoto was using the locker next to hers. On Tuesday, she traded routine compliments with LPGA Hall of Fame member Pat Bradley, who joined her for the last four holes of a practice round. "At first I was nervous," said O'Neil, who made the trip with her parents and college coach Beans Kelly. "It's just being here with all the people I've seen on television and playing the same course they are." As a prep golfer, O'Neil won four conference titles and two district championships, and was a two-time runner-up at the state tournament. As a freshman at the University of Georgia, she overcame a rough fall season to take over the No. 1 position in the Bulldogs' lineup, filling the slot vacated by Vicki Goetze, who turned down her final year of eligibility to join the LPGA Tour. O'Neil also hopes to make a living on the LPGA Tour. But her first trip to the U.S. Women's Open will be hard to top. Goodwill changes: The U.S. women's basketball team for the Goodwill Games has undergone a significant roster change after a disappointing third-place finish last month at the World Championships. Dropped from the squad were three-time Olympian Teresa Edwards, Katrina McLain and Connecticut sophomore-to-be Kara Walters. According to USA Basketball, all left because of schedule conflicts. Replacing them are 1992 Olympian Clarissa Davis-Wrightsil, Shanda Berry and Katie Smith. Davis-Wrightsil, 6 feet 1, is a veteran of international play with USA Basketball and professional teams in Italy, Japan and Turkey. She played collegiately at Texas. Berry, 6-3, is a 1989 graduate of Iowa and has played four years of professional ball. Smith becomes the youngest member of the Goodwill Games team, a junior-to-be who helped Ohio State reach the NCAA championship game as an All-America freshman in 1993. Davis-Wrightsil, Berry and Smith join previously named USA Women's Goodwill Games team members Jennifer Azzi, Ruthie Bolton-Holifield, Daedra Charles, Dena Head, Lisa Leslie, Andrea Lloyd, Carla McGhee, Dawn Staley and Sheryl Swoopes. The United States is the two-time defending Goodwill Games champion, as it was at the World Championships. This year's team began training last week in Charlotte, N.C.
On Friday, it plays the USA Select Team at 5:30 p.m., before the debut of Dream Team II, which plays the German national team. The Bulldogs did more than just sneak up on a few teams last year. They made the playoffs. Following a winless season, Zephyrhills shocked the competition in 1993 with a 7-3 regular-season mark, and then beat Hernando 7-0 in a three-team shootout that also included Pasco. A playoff loss to Seminole Osceola ended the Bulldogs' comeback season. This year will provide Zephyrhills with a stern test, but head coach Tom Fisher said his team will be ready. With eight seniors coming back, Fisher said the opposition is "going to know that we're capable of beating them. We're going for 11 games and, hopefully, 12 or more." Quarterback Donnie Pinkerton, a third-year starter, is back to lead the offense. He threw for 1,289 yards and 14 touchdowns last season. Just to keep defenses off balance, however, Fisher will insert 6-foot-4 left-handed quarterback Shawn Daughtery on occasion. Backfield speed provided by Mike Barber, Damien Pickett and Antarik Wilson also is a strength. "We've got more speed back there than we've had in a while," Fisher said. Last year's leading rusher was Troy Canty, who only gained 462 yards. Fisher figures one of his backs will easily surpass that. Jesse Matteson, last year's junior varsity quarterback, and Andrew Peeples are Fisher's secret weapons. Matteson can pass, play running back or wide out, and defend the ball in the secondary. Peeples could line up in the backfield, catch passes as a receiver, and play the monster position on the defensive line. He'll also snap the ball on punts and placekicks. The offensive line is a troublesome area though. "We're going to find some combination," Fisher said. "That's my main concern right now." Only Pinkerton, Hutcheson and Pickett, a freshman who did not play last season, remain from that 0-10 team. Most of the players remember what it's like to be in the playoffs, a place they'd like to be again. Passing game: Passes from a right-hander and a left-hander could confuse opposing secondaries. Pinkerton and Daughtery don't have a D.J. McCullough or Kevin McLeod (last year's second- and third-leading receivers in the county) to throw to, but wide outs Bryan Kim, Josh Willis, Ricky Moore and Shay Daughtery can catch the ball. B.J. Booker and Scott Cherry, a pair of tough blockers, are the tight ends. Running game: Speed and power are what you need in a backfield and Zephyrhills has plenty. The speed burners are Barber, Pickett and Wilson. They will be joined by fullbacks Ben Poe, Steve McKelvey and Tom Hutcheson. Offensive line: Sophomore T.J. Fiscarelli is bouncing back from grade problems and will probably miss the first game or two. Cherry, who could be moved to tackle, is the only senior. The rest of the group includes Joe Colandria, Jeremy Piercy, Damien Bennett, Clarence Roshel, Matt Sweet, Corey McLeod and Ethan McKelvey. Defensive line: Tackle Jeremy Cavollina is the standout here. The 5-foot-10, 210-pound junior bench-presses 325 pounds. Piercy and Colandria also play tackle. Booker and Cherry line up at the ends and will be spelled by Pinkerton and Hutcheson. Linebackers: Poe, a hard-hitting senior who stood Pasco County rushing leader Trevor Lansford up at the line of scrimmage in a goal-line stand against Land O’ Lakes last year, is the man in the middle. Bennett and McKelvey make this a solid linebacking core. Defensive backs: Kim is a steady cornerback who defends the pass well and comes up quickly against the run. This secondary is solid with Pickett, Shawn Daughtery, Willis, Moore and Barber. They are not likely to get burned. Kicking game: Hutcheson, a senior who has kicked for the most points in school history, will add to his record totals this season. He also punts, but Poe may get a shot at that position as well. Matteson can do both. The coach: Fisher, whose highs and lows are never extreme, did a superb job with last year's team after that forgettable winless season. Entering his sixth year at Zephyrhills, he is on the winning track with a 30-23 mark. Outlook: Offensive line play will determine how far the Bulldogs go. A strong defensive effort could take some of the pressure off, and big plays from the offense will excite the home crowds. Coach: Tom Fisher (sixth year). Assistant coaches: Chris Bounell, Gary Butler, Bruce Cimorelli, Phil Pignatano. The ZHS FFA proudly represented our school at this year’s Pasco County Fair. A record number of animals were entered into competition county-wide. This year’s fair included a total of 62 steer and 130 swine projects. High School FFA members who raised a steer for competition included: Chris Batch, Sherri Brown, Amy Cartwright, John Combs, Jennifer Fava, Keith Hayford, Justin Monbarren, David Murphy, Morgan Steward, Shane Williamson (Chapter Steer), Curtis Williamson, Jason Wise and Matthew Wood. Matthew Wood’s steer placed second in its weight division (the first place steer in this division was the Grand Champion!). Jennifer Fava’s steer also placed second it its weight division. Swine exhibitors included Amy Cartwright, Chris Batch, David Belcher, Scott Cherry, John Combs, Michael Holloway-Forgie, Laura Fuller, Keith Hayford, Dustin Hoyle, Jennifer Jones, Eddy Leidenheimer, Justin Monbarren, David Murphy, John Partain, Travis Stephens, Morgan Steward, Adam Wilkes, Curtis Williamson, Jason Wise and Paul Wood. The swine were divided into 10 classes based upon their weight. Amy Cartwright’s 230-lb. entry placed second it its class; John Combs exhibited a 250-lb entry which placed first in its class. Justin Monbarren’s 256-lb. entry placed third in its division. Curtis Williamson’s 266-lb pig placed second in its division. David Murphy’s 284-lb. entry placed second in the heaviest class along with Scott Cherry’s 280-lb. entry which placed third in its division. A special recognition was earned by Eddy Leidenheimer as he was called back for showmanship in the swine competition. Judges in both the steer and swine competition explained the quality of this year’s animals made evaluating them very difficult. Congratulations to each ZHS FFA student on a job well done! On Saturday, February 26, ZHS also won the Pasco County Science Fair by placing four students on the State Science Fair Team. The winners were Ryan Dye-Physics; Chut Sombatmai-Earth and Space Science; Jason Gryzna—Environmental Science; and Tim Delgado—Computers. The Daybreak Rotary Club recently awarded Zephyrhills High School senior Samantha Murrill a $25 savings bond for being selected as the September Student of the Month and placing as a semifinalist in the 1995 National Merit Scholarship competition. Charlie Demosthenous and Steven Lyons, both seniors at Zephyrhills High School, were named commended students in the 1995 National Merit Scholarship competition. Chut Sombutmai and Amanda Schwab, both juniors at Zephyrhills High School, have been selected to attend the National Young Leaders Conference in Washington, D.C. The theme for the conference, Tuesday through Dec. 4, is "The Leaders of Tomorrow Meeting the Leaders of Today." The students will participate in a number of leadership skill-building activities. Sombutmai is involved in the National Honor Society and Future Business Leaders of America and is on the writing staff of the Bulldogger, the school newspaper. Miss Schwab is junior class president and a varsity cheerleader. She works on the school newspaper, the Bulldogger, and is a member of Student Council, Pride and Alpha Omega, a service sorority. She is a member of the tennis team and the National Honor Society. Last year, Miss Schwab spent a week of study in Washington, D.C., as part of the Close-Up program. Female ZHS Grad Seeks Baseball Fame. Because Mikolajczak is good. In fact, the 25-year old is so good that last month, she played with the Colorado Silver Bullets, the professional women’s baseball team that will play in the Northern League against men’s minor league teams this season. Although she survived the first two cuts, which whittled the team down from the initial 48 women to 30, she was released in the final trim to 24 players. But she said one of the Bullets’ coaches confirmed that she is on top of the call-back list, which means if any Colorado infielder is injured, Mikolajczak, a second baseman, could join the team. What’s more, she can bash with the best of them. She’s hit a home run in practice, and in a training game at the Bullet’s Camp at Tinker Field, in Orlando, she sent one to the warning track. But she’s not bitter about being kept out of Zephyrhills Little League when she was younger; she’s using the moment as motivation. “Women haven’t been allowed (to play). Now is the age of gender equity. The women are just as good as the guys, the guys just have better equipment. Men and women alike will be surprised at how good women are,” she said. As proof, Mikolajczak said pitcher, Charlotte Wiley hit at least four homeruns in practice and Lisa Fritz, the oldest player in the camp at 36, also sent one to the fences. 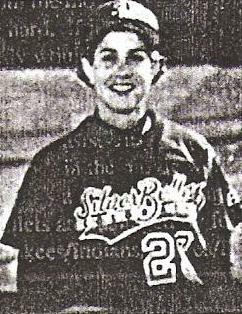 Pitcher Lisa Martinez has an underhand knuckleball in her arsenal, and in a game against a men’s team two weeks ago, Bullets hurler Lee Ann Ketcham struck out five in three innings. But as any baseball stat nerd can tell you, all this is about as surprising as Madonna showing up at Frederick’s of Hollywood. In an exhibition game on April 2, 1931, 17-year old Jackie Mitchell took the mound for the Class AA Chattanooga Lookouts. Her opponent that night was the New York Yankees, and she did something Walter Johnson and Dizzy Dean probably dreamed of frequently; she struck out Babe Ruth and Lou Gehrig, back to back. And don’t forget the All-American Girls Professional Baseball League which from 1943-1954 featured 500 different female athletes who played well enough to draw 1 million fans in 1948. Mikolajczak saw scenes from the movie played out on Tinker Field on a daily basis. Just as the Rockford Peaches in the movie were managed by a former big leaguer, the Bullets are managed by former Yankees/Indians/Braves/Blue Jays pitcher, Phil Nickro. Where the movie manager had to lecture, that “there’s no crying in baseball," Nickro also had to dole out a treatise on baseball etiquette. During the Bullets’ first scrimmage, both sides began chanting and singing, as they were trained in collegiate softball. And when outfielder Allison Geatches hit a triple, she hugged third base coach John Nickro in her exuberance. And while a player in the movie was superstitious about changing her socks during a winning streak, Mikolajczak’s idiosyncrasies weren’t as pungent, no doubt to the relief of her teammates. When I’m hitting well, I wear the same helmet and sit on a particular spot on the bench,” she said. Mikolajzak’s journey to professional baseball history took her through Zephyrhills High School, where she was a major force in volleyball, softball, and girls basketball teams. The athlete then attended the University of Virginia, where she lettered all four years in softball and volleyball and earned her master’s degree in rhetoric and communications along the way. During a break in her career as an assistant volleyball coach at the University, Mikolajzak was one of 300 athletes who tried out for the team. She was selected as an alternate, but wanted to make the team, so she tried out again. The try-outs were the most tense experiences of her life. Everyone was required to field ground balls, take five swings and run a 40-yard dash. Mikolajczak had her own personal nightmare because she had to go first, and because the wooden bats used in the sessions weren’t marked, so she had to guess at the size of her bat. Despite her earlier athletic success, Mikolajczak wasn’t sure if she had a chance with the team. So the night the team was scheduled to call her back, Mikolajczak went to a Virginia-Wake Forest basketball game. When she got back to her room, there was an invitation from the Bullets on her answering machine. Even though Mikolajczak loved her coaching job, she didn’t look back on her way to Orlando. “I never get really excited, but this part of the excitement came from a deep affection for baseball after a childhood spent watching Cubs games, following the careers of Rod Carew and Ozzie Smith and learning the game from her dad. Once she reached the camp, the coach with two years under her belt had an advantage. “I knew there is no meaning sometimes in why coaches do things,” she said. Mikolajczak also learned from her trouble finding suitable bats at the try-outs. “In camp, I went in early and hid bats. And I never broke a bat.” She said. The player also said she was bolstered by support from residents of Zephyrhills including girl’s basketball coach, Ernie Pittman, and her old softball coach. Spring training consisted of scrimmages and hard work, mixed with trips to Walt Disney World, steak dinners and uniforms prepared for the women each day. But the adventure wasn’t all fun and games, because each week ended with the 7:15 Sunday night phone call. Mikolajczak said if you got the call that said to come down to room 810, you had been “ousted” from the team. The reasons the team gave for cutting her were “intangibles” such as not throwing the ball with two finders. But Mikolajczak said the decision wasn’t too painful because she thinks she’ll be called back.